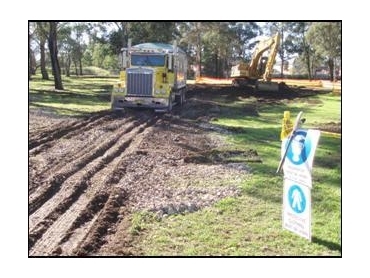 In June 2007, Getex worked alongside a Western Sydney City Council to remediate illegally dumped contaminated soil stockpiles from unused council land. Initially, Getex visited the site to investigate and inspect stockpiles of soil located on site to confirm the presence of asbestos and/or asbestos containing materials (ACM). It was discovered that previous sampling had identified that all of the stockpiles on site contained levels of heavy metals and asbestos materials. Getex confirmed that asbestos containing materials were extensive throughout the stockpiled soil. In preparation for the removal of the contaminated soil, Getex collected samples for soil disposal (classification) purposes and prepared a Soil Disposal Report . for presentation by the waste transporter to the licensed waste receiving facility, in accordance with “Environmental Guidelines: Assessment, Classification and Management of Liquid and Non-liquid Wastes” (Department of Environment and Conservation (NSW), 2004). GETEX then compiled an Asbestos Removal Control Plan (ARCP)). The ARCP was prepared to ensure that all stockpiles contaminated with hazardous materials were removed with appropriate care and consideration to those involved in the removal process, adjoining parties and the environment. The ARCP outlined the need for an exclusion zone to be established, labelled with appropriate signage and monitored for airborne asbestos fibres with strict adherence to the standard procedures for the removal of asbestos as outlined in the National Occupational Health and Safety Commission (NOHSC) guidelines “Code of Practice for the Safe Removal of Asbestos [NOHSC:2002(2005)]”. As an example of the level of care implemented by GETEX on behalf of the Local Council, a necessary protection measure implemented in accordance with the ARCP was a decontamination area installed to facilitate the cleaning of trucks. A separate area and equipment was also provided for the decontamination of personnel at the end of each work shift and disposal of worker’s personal protective equipment (PPE). As part of the process of the removal of contaminated soil from the site, each time a truck (and/or equipment) was required to leave the site (and upon the completion of works each day), each truck (and/or equipment) underwent a rigorous decontamination procedure in the designated asbestos decontamination area. The air was monitored for airborne asbestos fibres by Getex in the vicinity of the decontamination area (in addition to the boundary of the removal areas) to ensure the safety of the general public and a disposable water filter system was installed to minimise the risk of environmental contamination. A decision by the Council to approve the sub-contracting by Getex of an experienced licenced friable asbestos removal and civil contractor was a principle component of the project’s success. The contractor chosen to provide the excavation, transport from the site and disposal of the soil contaminated with heavy metals and damaged asbestos containing materials was Enviropacific Environmental Services an AS1 (friable asbestos) licenced contractor and contaminated site remediation and waste management service provider. Enviropacific Environmental Services were engaged by Getex as the contractor for the duration of the removal project. Inclement weather during some stages of the project made for near impossible work conditions with the fully loaded heavy trucks encountering problems with the soft earth. Quick and decisive variation approval from the Council allowed the rapid construction of access roads leading to the successful removal of 800 tonnes of the contaminated waste before the June 30, the new financial year when waste disposal price increases. This was beneficial to all parties with a significant financial saving for the Council and swift disposal of the hazardous materials from the area. To ensure the safety of workers and the general public, the Council approved daily Airborne Asbestos Air Monitoring during the removal works. This provided significant reassurance to all concerned parties and assisted in the control of asbestos removal works on site. All asbestos air monitoring was completed by Getex in accordance with National Occupational Health & Safety Commission (NOHSC) Code of Practice for the Safe Removal of Asbestos 2nd Edition [NOHSC: 2002(2005)] and Guidance Note on the Membrane Filter Method for Estimating Airborne Asbestos Fibres 2nd Edition [NOHSC: 3003(2005)] in conformance to the requirements of the NSW Occupational Health and Safety Act 2000 and the NSW Occupational Health and Safety Regulation 2001. At the completion of each day the air monitors were collected and analysed in our modern NATA accredited Getex laboratory at North Ryde, Sydney for the presence of airborne asbestos fibres. Strict adherence to the ARCP and Code of Practice for the Safe Removal of Asbestos 2nd Edition resulted in all airborne asbestos levels being below the limit of detection for the membrane filter method monitoring technique. After the satisfactory removal of each stockpile a Getex Occupational Hygienist issued an Asbestos Clearance Certificate to confirm that removal of the contaminated soil had been completed to an appropriate industry standard. The removal of the contaminated stockpiles was of both a large scale and of sensitive nature. A combination of professional project management, appropriate removal contractor and coordination from Getex and the positive attitude and response time of the local Council lead to the project being a success for both the Council and its residents.